Unless you one is roping cows, why jeans? They are rough on the skin and worse. They are UGLY to look at. They lie who say the worn ones are even better. The passive-aggressive message of jeans is so hateful, they probably cause terrorism. I love Neimans, but you USED to be sure we were all trained in Appropriate Dress for All Occasions....what happened? Someone's printer jammed and had ink for one word; JEANS ....and it's been stuck there for fifty years now...help. Blessed with a fine classic American Family, and plenty of them, Christmas was full of all the activities that are thought traditional and each year, it seemed one more thing we might do or pray or sing or visit! Then life Changed - the star on top of my Christmas tree was my beautiful husband - we enjoyed the best ever Christmas Wedding and it stayed like that all year long with us; and the years we enjoyed so well together glowed and grew in worth, till his early and sudden death one July morning. That first Christmas without him was not easy for me, broken hearted, or for our two early teens, son and daughter, without their Dad, and tears instead of laughter for the first time in their lives. But we DID it! Our emotions were a mess, but we became “Team Family” fast and created a number of things, drawing on our accumulated glow, to save the day and Save the Season and bring the celebration back fast. But it had been six months since our grief, and we were off the 911 list for grief-shock care, and we could do it, we were ready. Not so easy when we lose a close other AT the Winter Holidays….at best, the work of closure and rites and funeral and estate actions - tiring and conflicted grieving and celebration at once. At best, one accepts the idea that “This Christmas is beautiful but quieter than usual”, as we pick our way carefully along the tricky path. We lost a close one of the “Kidz on the Block” and our Mother last Christmas - one was too young and the other so happy to be meeting loved ones in heaven ahead of her, after a grand long life of 92 years! Still, Christmas was definitely different last year and at this first anniversary of their passing, it’s still a bit quiet by choice, but then our family rules say we must put it away. Today’s way with life and death can be too cold for many, and some places in society will give you 72 hours to get over it, while others, tied to the past, demand you wear mourning for the rest of your life. It is never easy, but not impossible. Most of us take this moment in things to sort it out and choose the good thing to do - the thing that WORKS - the thing does the right job by ourselves and others, the thing that leads to the best healing path possible, the thing that empowers closure. I noticed that there simply are not that many top movies about Thanksgiving - all the older films give in to the Stereotypical Tale of Pilgrims and Indians. The story is true, more or less, and powerful and happy and full of hope from its inspiration of the triumph of the human soul in adapting to new environments and making friends with foreign people. But there are not really all that many of them and particularly compared to the other main history and holiday fare. JOHN HOWLAND was Pilgrims' ship Mayflower passenger, an indentured servant. IN the storms at sea they endured, John Howland was tossed overboard in lurching moment of the ship, in a gale en route to the New World. He was able to grab a rope and hang on, though he was dragged under mightily, and was hauled back on board......and survived. He made it to the New World and thrived, worked off his indenture and became a pillar of the community. He then married Elizabeth Tilley and with her, parented 10 children, 88 Grandchildren, and over the next 4 centuries, they were descended by 2 million Americans, including both Bush Presidents, Emerson, the Mormons' founder, Joseph Smith, Franklin Roosevelt , Humphrey Bogart, Chevy Chase,....etc... all because one man grabbed a halyard and lived thru a stormtoss! God Bless America! May we always have hope and work our best and love the destinies, accepting their wisdom as empowering, and may be always see the opportunities they bring! The film then goes on to reveal TRUTH of the voyage, first encounters with land and its people, disease , confusion, betrayals , and death …but then the final success of the basic goal, while failing the goal of Spiritual perfection. photo of one of the neat Halloween beverages - article is about SAFETY with Dry Ice to produce the spooky fun fog. We’re not looking for a handout, just a hand ! You may read about million-dollar art sales and declare, "I don't buy art - way out of my reach or interest! " But a World of Really Nice ORIGINAL ART is out there and here at ellefagan.com. The money spent on a fine arts purchase is ALWAYS well-spent and NEVER WASTED. If you buy it and love it - bliss! ORRRR.. enjoy it for a bit, then pass it on as a deductible gift to a friend or donation to your church or club's fundraiser - it will be appreciated and never a financial loss to you. Some buy varied artworks and shift them about at change of season, or to enhance a special event or holiday. So many ways to let fine art enrich your life. ONE caution: avoid gifting or donating really large works - too often it is tooooo much and then the recipient feels pressed to receive it and figure out what to DO with it. But most small works do DELIGHT as a gift or donation and be sure to tell the recipient to "pass it on" to keep the spirit alive in it. Works. Even at first purchase of a major work, from the artist, the money is NOT a impediment. Pay in payments, or use escrow.com to hold the cash or art till everyone is happy. SAFE - very safe that way. For modestly-priced items like the ones at my site, it is no strain and there are discounts available. Choose your work , contact the artist and get your code to enter a the checkout - done and done! 1. Tax included in sale price + Free Shipping in USA - no code required. ALWAYS to continental American addresses, on all artwork at the site and offline, too. NOT always applicable to International rates. Higher shipping rates sometimes make it not possible to offer free shipping internationally. 2. TAAF - cause for The Aneurysm and AVM Foundation. Gets the thing that got my husband. 3. Tiny Miracles - another favorite - they help premature babies and their families. Today's way with the fixes for the frequent birth defects would have found and fixed an aneurysm long before it could harm. 4. PATRIOT - the newest - you get the art at 25% off AND we send part of the original price to YOUR choice of valid Veterans Group. 5. Art With Heart - if you opt to donate part of your purchase price to YOUR choice of valid Charity, there is an additional 20% off the sale price. If you can think of a worthy way to make our Artsale Transaction a thing that helps the world as well, let me know. I donate work outright for selected events. Find me to talk about it, online or at my new office. Last year's election campaign rattled me quite a bit, and I published a blog entry saying I could do better. A year and a half later, I am calm and even appeased. God Bless you President Donald J. Trump and I DID vote for you, misgivings notwithstanding, because I know we can Make America Great Again with you at the helm. Politics has NOTHING to do with good government and yet we take it that way every election time for the esprit - our lives and the lives of our children are at stake and we "mostly show up and make noise". Esprit is important in the world arena and in the hearts of voters, but there is so much more! I have campaigned for my candidates and almost always either donate art for the fundraisers or make the 500 phone calls. I donate cash when I have it. I BELIEVE ! But too often , after election day, ours is such a poor show that if we fail, it will most likely be about audience disinterest. We are government of, for and by the people. That means we must DO something - a bit each day, week, month , year. Not just casting a poorly-informed vote. We think we can cave into citizens' cynicism and nothing bad will happen, but plenty bad does happen every day in this country from citizen disinterest. We can bring a government to life and we can kill it. THAT is the bottom line of "Government of, for and by the people. " I think you should "Vote for Elle" as they said in Legally Blonde 2. But this President is doing some things right! When it's my turn, I am keeping this list, with insights , corrections and updates. Comment welcome. Why vote for ELLE SMITH FAGAN - she is America. Glorying in the fact that she was a nice kind of typical Norman Rockwell American girl. A super background full of the best and worst and met with character, ingenuity, action and great love. The kind of childhood that encourages a person to be an adult who is ABLE to do a few things. Money can be a winner again - balance the books as with any other group; give modestly till we are in the black and then resume better generosity; collect debts responsibly; OWN the casinos - adds a lot of money and subtracts a lot of crime in that realm ; prisons CAN be self-supporting , which teaches integrity to all involved and provides enough cash to allow law enforcement to apprehend and imprison as needed and not let things go by. Clean and Green - laws to require cleanups of abandoned places and greenspace restored. This upgrades both public health and wealth and reduces crime that seeks the dark and dirty corners. Population life expectancy will improve with less disease. Honesty and disclosure. It's our country and digitization means we CAN be better informed and easily with even daily referendums on issues on our block, in our town and in our state and nation. Thinking out of the box to optimize the box - - world peace is not a joke - police and soldiers have no reason to get lethal MOST of the time and must wear armor and show at least the intelligence of the medieval knight...suicide is illegal. Occupant Safety & Escape Tech that should have been done by our bi-centennial needs to be done NOW - safe supported ejection is very affordable and do-able - and tons better than Nineleven was for us. Health and life quality - has been crippled by bad attitude and uproar since it's start because it was new, but nottanymore; we can enjoy better success for all sides with comprehensive coverage - accepting dental and mental and family coverage as equal to other basic medical, since they allll surely kill if failed. Right to life / humanity - there is no longer any need for Abortion: Church and State are on the same page. Birth control and the safe morning after teas and over-the-counter meds fix the issue, and there is the fact that today's Equal Rights Woman MUST take Equal Responsibility as in all other places in life. If a woman becomes pregnant she bears the child and lets it be raised with our without her. Society has come to accept the unmarried pregnant person as part of today's norm. She can do her life happily, before during and afterward, knowing she has done the best thing. We must never denying a life we have created. WE CAN FIX things because of our wonderful empowering and adaptable Constitution. We DO, in our humanity, buy our issues with both hands and we DO then expect respect when we merely react to these issues like hysterics and refuse to confront and win - and "set it back to rights" . We need to continue in equal rights on the basis of any criteria. One bully is the same as another. Our nation, The United States of America, was and is the best ever dreamt of, bled for and won! We have no right to neglect her to death! Vote for Elle and at least that much will be better. Since an accident years ago I use a tracker to make sure I am self-managing right. Now, at upper-midlife , I added Apple Watch at my birthday a few weeks ago, to my Apple devices.....Time, Heart rate, Blood Pressure and all fitness tracking and waterproof for my pool aerobics and laps. GPS and 911 and phone on board - YES. I was singing "Getting to know you" to my Watch, while prepping in my large work area, indoors, for the big Spring shows...I am in arts. The fume-y solvent to shine the frame was usually used outdoors, but it was just a small fix - a few minutes indoors with fumes I love would not hurt me. But then a stubborn spot on the antique frame made me put away one solvent and reach for a second one - I thought I'd waited long enough between fume exposure...no. Without realizing it. I was "woozy" and did not feel my body reacting. Then, in my peripheral vision I saw my Apple Watch flashing large and red - 208bpm - in big numbers on the watch face. The device was new, and I thought " what error code is this?" then realized Apple Watch was NOT popping and error code - it was an emergency warning! Big numbers in red and hapticks of which i was unaware. I felt fiiiiiiiine - love fumes - but I would NOT feel fine for long. Immediately! Nearby exhaust Fan on, caps on the solvent and me out the door in ten seconds flat, for fresh air! Heart rate , BPM went right back down 68 in one minute thanks to good fitness. As I calmed down I began to share my experience to warn others and to praise APPLE . Next I thought: I'll bet I am NOT the only one who was saved by their Apple Watch. I found a site online in search that talked about it - YES others were saying, "Apple Watch saved my life!" Many of them sent a thank you to Apple CEO Tim Cook, so I did that and shared also at my AppleWatch Facebook Group. Thanks to all the factors in my "little bad moment" and especially to Apple Watch....for what did NOT happen. Sharing the story not just to praise APPLE, but to pas this on for a summer safety reminder. HAVE FUN BUT STAY SAFE ! Sometimes, when we are moved to tears at occasions like today, we are truly "tapping the brakes" - releasing some small bit of the larger emotions, so as not to die from them when they come to our door. Poppies Flanders Field Poem shared here as well. Memorial Day - When I was a girl the little paper flowers, sold for a dollar by VFW and AL, were part of the Memorial Day excitement for me ! The music and marching bands were nice of course, and the gathering of family and picnic later, but for a LITTLE person, the special LITTLE poppies and forget-me-nots won the moment, for a moment, off and on, all day long and sometimes saved in my room at day's end. My seven Irish Uncles..all proud AL members after WWII , would smile at me and call me "Miss Memorial Day" - I was six. Fairfield was nickname heaven and one more nickname was fine with me. I smiled back, and hugged. by Col.John McCrae of the Canadian forces, before the US entered WWI.
" In this century alone, more than 619,000 American men and women lost their lives in armed conflict while fighting for their country. More than 1.1 million were wounded -- many of them maimed or disabled for the rest of their lives. These men and women were our neighbors, our sons, daughters, mothers, fathers, sisters, brothers, husbands and wives. Thirty-five million more Americans served, fought and survived this century's wars. Buy a poppy - and support all those who served and are no longer with us. Exult - rejoice - they were proud to serve and served well and As Lincoln declared at Gettysburg, gave "the highest measure of devotion". Love - all love - is risk and challenge, and sometimes the pain of injury or loss - not just kisses, parties and parades. Ohhhhh but worth it! "Asparagus, like folk, grow best in bunches"
So good to be fine and fit to recover my career and income a bit before I am too old! But nobody does it alone - Old friends from work and school encouraged a bit, but I had to move to a new private home of my own, and so it is primarily new friends helping - in the Glastonbury, Connecticut suburb of the state Capitol, Hartford.
" During America's Revolutionary War, part of the sophomore and junior classes of Yale University was moved to homes in Glassenbury [ the way it was spelled at that time] , in case of a lack of food in the city, or attack on New Haven Harbor. Noah Webster was one of the students who were moved to town. Later, he taught here in one of Glassenbury’s 10 one room school houses. " Recently it's Chamber combined with that of East Hartford to form the "Connecticut River Valley Chamber of Commerce" with twice the resources and networking options and events, to empower a lively commerce in the area! CRV Chamber, Thank you very much! UPDATE: NEW OFFICE ! joining one of the chamber's many networking events, I met Carolyne Gatesy of Main Street Office Center in Glastonbury Center between the Library and Daybreak Coffee Roasters. Their office packages are flexible to accommodate the full range of need and I signed up almost immediately. If you knew me, the location alone is perfect - love for books and coffee - yes...love for engagement for nice events in a nice environment- yes. Affordable - yes! Stop in and see me, but call first, since the artists is "all over the place" and gratefully so! Finally viewed "Sully" but not for the last time ! just some comments after viewing "Sully" - true story film. The nearly 300 episodes reporting the exploits of Earl Stanley Gardner's "Perry Mason" seem to be so right - Raymond Burr and Justice , always impressing in a big way...and now with a huge archive to share..fun. The earth's crust is just that - a crust - and pilings sent beyond and much further down into the top layer have already made skyscrapers immune to techtonic upsets- even winning over Japan's frequent earthquake issues. Please LOOK AGAIN - the skycrapers poking nicely upward should be the tip of the iceberg, so to speak - with twice the constructions BELOW ground to support and strengthen the earth below, and to lighten our "green footprint" with much much more underground construction - yay hobbits! Perhaps Tolkien called them "Smials" for a reason - smile. 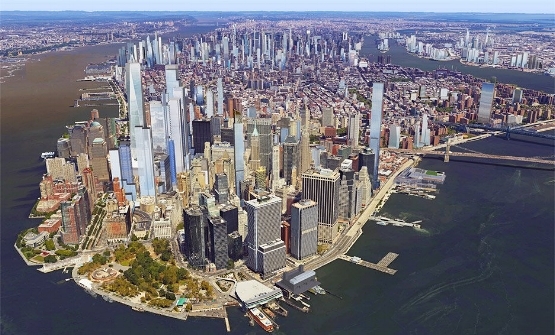 Visualizations of planned and existing structures in Lower Manhattan per DeZeen - innovations site. But there is MORE here - the genius salvation happens , if these planned constructions include the modern deep-sunk pilings and underground work: THINK about the concept of shoring up the earth AS we build EVERYWHERE on our earth in general - with techtonic plate SUPPORTS and underground superglue so that our coasts and fragile inland areas no longer need to be in imminent danger of falling off into the abyss. And they can - geologists predict it and once it begins, it can take out 8 miles inward on the entire coastline, north to south, along the shores...and much more - our vision is kindergarten...we see land and land's end....it's MUCH more than that. Google it. "While I'm up" - we DO need the oxygen/carbon dioxide exchange to be restored with rooftop and wall gardens the rule, not the exception, and MOST parking lots can easily be sent underground as well, with gardens and parks in their place, above ground, for beauty and even more, for our health and survival. The reflective concept of the buildings can be a life and vision problem, too - are they addressing this issue? Living / working daily on the higher floors means getting used to more than the wobble of the earth as always happens Can we thrive in buildings that sway in the breezes at that height - the twin towers would wave 30 feet and more, back and forth....WHILE the window-washers did their job. Robotic washing WOULD be bright, in any event. But FINALLY and most of all: BEFORE the Freedom Tower was built, these showoff architects I love needed to build the pods - elevator-like constructions that insert between inner and outer walls of these buildings - they ARE able to be done. They ARE able to accommodate the occupants on each floor, no matter how high up- and able to eject from the building and safely usher them to ground - in under ten minutes. Buildings may fail , but why should that mean death for the occupants? My FATHER and AERO-TECH pals had the drawings done and promised that ,by the time I grew up, they would be a reality, but only the jet pilot ejection seats got done back then - the rest was considered "ahead of itself" and suppressed. AND SO...as a direct result - planes and tall buildings can be deathtraps as terrorist targets, no matter how sound the construction - and people died on Nineleven 2001 who did NOT need to die. These pods are, in concept, so easy that they can be installed in most buildings , old and new. But so far, if you ask MIT , they can't be bothered - they are designing neat new video games. DITTO the detatchable passenger cabins for planes that safely eject and touchdown passengers on land or sea with first aid, food and GPS to bring help quickly. THINK and get those petitions going, or it won't get done - and we can go on being unforgivably blind to the totally unnecessary loss of life. There are several ways to empower them for action and all perfectly do-able today....in fact, they were on the table when the first pilot ejection seats were done up 50 years ago. Back then, technology was primitive and expensive -too expensive - for practical application - but nottanymore. MAKE THEM DO IT. Freedom Tower is a limp-wristed memorial to those who died and those who grieve for them - a better one would be the good escape technology for buildings and planes, so that we can We remember - NEVER AGAIN! Children do learn what they live - no police-state classrooms, please, but effective SAFE ZONES instead. Take your children home till they calm down find some brains and USE them in this matter. The quality of life of all is at stake. For a time in the past, our schools were policed in the south, where civil rights issues terrified all, until that time passed. Sadly, today the President said we may be doing it again - this time nationwide. NOT any hope at all to Make America Great Again now! I hope that the action plans in the matter of reaction to the School Shootings will evolve. I love our President and his All-American , courageous ways, but , As Rosie said "The African Queen" - "ohhhh! Our first quarrel, darling ! " I yelped when the President SAID, as though to me and families and teachers - " making safe school zone does not work ". Thousands can show him otherwise. They must allowed their fair moment on the topic, "to turn the mind of the king" ! SAFE SCHOOL ZONES does work and is easy to do effectively. Upgrading tech surveillance on the campuses for a fair periphery , with upgraded real surveillance and safety/security protections , like a stand of oaks, surrounding the zone WORKS. And it works fast and NOW, while improved gun laws and AMERICA'S EVOLUTION finally "gets there" a bit. Take one full minute to Google it - AMERICA is the worst on earth for violence and it will get WORSE, no matter who says what, UNLESS and UNTIL our leaders stop being afraid to ACT BIG - to achieve better , ARMED WITH MORE BRAINS / LESS BRAWN, please... with much better support for ALL of US. END GUN CULTURE...the whole world, except us, took up this banner and we helped them, and the statistics prove it works and life is BETTER. This Super Win is easier than dreamed, but even if we start today, it will take time before we "get there" on it in our daily lives! The longest journey begins with that first step. MAGA - Make America Great Again, cannot happen if we , increasingly, pay for and do not get basic safety and non-violent days and nights. THINK. Take your children home - making a home school is NOT so difficult, and it is honored in most states and wins a tax deduction. Home and small group school is healthier, right now - and certainly better than waving a cheery good-bye to your child in the morning and crying at the child's empty seat at the dinner table that night. WE CAN SO THIS ! Praying for the President at this scary time - praying they do not fly off the handle and make it worse instead of better. YES I am qualified to write here a veteran worker / teacher / group leader and mother - in pioneer projects for church school and community since girlhood. The CHILD is not a KID. Timeline - 1. pivotal moment August 1984. I'd been away from home so long , but home on this day ! Driving through childhood neighborhoods full of sunshine and beauty and health, I suddenly remembered that , as a girl, I had a pronounced septum in the center of my upper lip. I thought it pretty at the time. I blushed , driving, and checked for it - it was gone! Under the circumstances, not surprised. I spent some time in many moments that week seeking it. Found it. Better. In the past three years before that moment, every destructive thing that can happen at a lady was inflicted on my honored and innocent self, till finding that septum was important. I would be just plain dazed, in-between tasks for the survival of my "nothing bad ever happens to me" self and our gifted and worthy son and daughter. Oh la! And now it seemed we were going to make it! The dust from the troubling of our path was blinding sometimes, so I knew I'd better watch for things - a few difficult ones - to fix as it cleared, but it looked like we'd make it just fine after all ! I'd seen "us " in my minds eye years before there was an "us" - in detail that was scary, actually but grand. I prepared. I was ready and jubilant and grateful. My late husband and I did so well , and then even better with the children, and we welcomed all aspects of a good and giving life, for seventeen years. But then he woke up one morning, we kissed, and his aneurysm burst, he fell and died. The 1981 moment. I'd not been a chattel, or dormant at all, ever , and yet, not just our lives had been stricken - our matrix had gone mad, at that time, inflicting further injuries on us while grieving. In 1981, Praising God was not the sterile act of a dutiful soul, or the dainty act of a churchlady, but horrible life breaths, in gasps of gratitude, for the holy strength that allowed us to cope and even win the moments. Before the promised new sunrise arrived, there was a very long night - and I knew the heart of the Mother in the Solomon story and worse. Even major achievements in life before and since, were non-events by comparison. I have been an innocent accused and slandered and at one point, literally beaten, raped, robbed and left for dead in a ditch. And obstructed in obtaining justice and even modest compensation. Therefore: what I was not able to fix I must at least report and share. It's stories - true ones. If it is true, if it is real, if it is life - yours, mine , ours - it is not boring. May the telling of it support that thought. Tell me where it bores or oppresses - it is not chiseled in granite - usually easy to fix and still stay true. Timeline - 2. why is it about time? Happy New Year! It is a beautiful new year and I am thrilled - truly thrilled - about a lot of things in my life, at upper midlife. This is the first of "Timeline" stories. Introduction of a sort. Work and love to share in all directions and good health, gold stars, and a neat snowy night in Connecticut to write its start. still, to maybe do the good things, before I am too old, or lose health and powers. This is a good time: Profound terrors and trepidations have been won through - most with Triumph - a few unfixable Failures. But both took years to integrate into the normal flow of life, so that they could be written and shared. I will be genuine - not vain with masks anyone can penetrate - Life is easy - pay attention. Our successes or failures must not blind us to that bit in the human genome where lives the appreciation of the miracle of life. It is that passionate, active-not-dallying appreciation that makes us want to continue the journey - do more life - even on the most terrifying, traumatic, tragic, pathetic of days ! And prepare to show the heart, the smile and grace for the grand moments that must be just right. Age may pale out our bodies, but so far, there is still that desire and instinct to rejuvenate that dynamic appreciation - mindfulness, maybe. The stories help restore the moments on this timeline that spark the rest, to create the continuum, and even entertain and inspire.